We are delighted to present the new Fairy Dust Lustre range by Anita Harris. There are currently 4 pieces in the range: Minos Vase, Skittle Vase, and Small & Medium Tojan Vases. All pieces are hand painted and Made in England. Each piece has the Carltonw Ware script mark and Anita Art Harris Pottery mark. 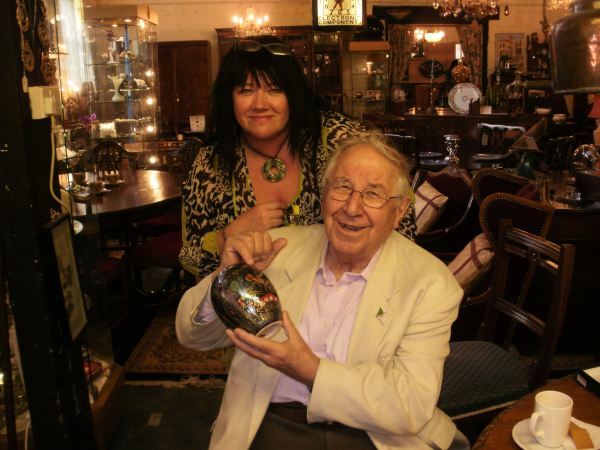 Pictured right: Anita with Henry Sandon who is very enthusiastic about the new range of Fairy Dust Lustre designs. Anita Harris is one of the best ceramic designers of our age. During the last decade she has worked for Poole Pottery, Cobridge and Stoneware and now she has produced some exclusive commissions for Carlton Ware. She is well known for her vibrant colours and inventive glaze techniques. She is truly one of the UK’s top designers.